This is the story of the day! Rain began just before Sasha was scheduled to go on. Now play is suspended for the day. Play begins tomorrow at 8am. Ugh!! We left Notre Dame on Friday afternoon and drove to Chicago. 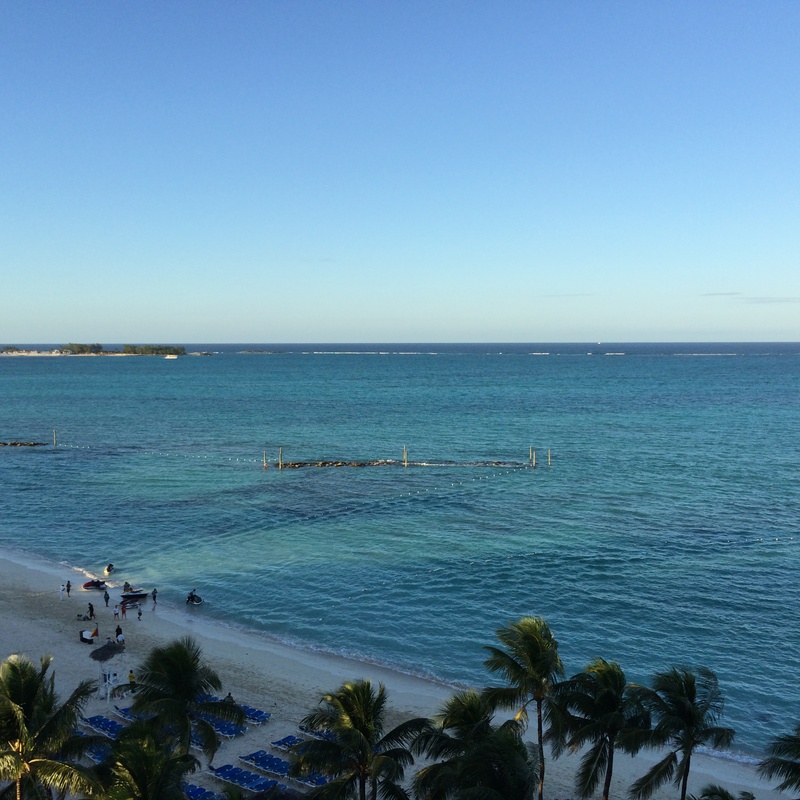 We returned the car and stayed at the airport Hilton since we had a 6:15am flight to Nassau. 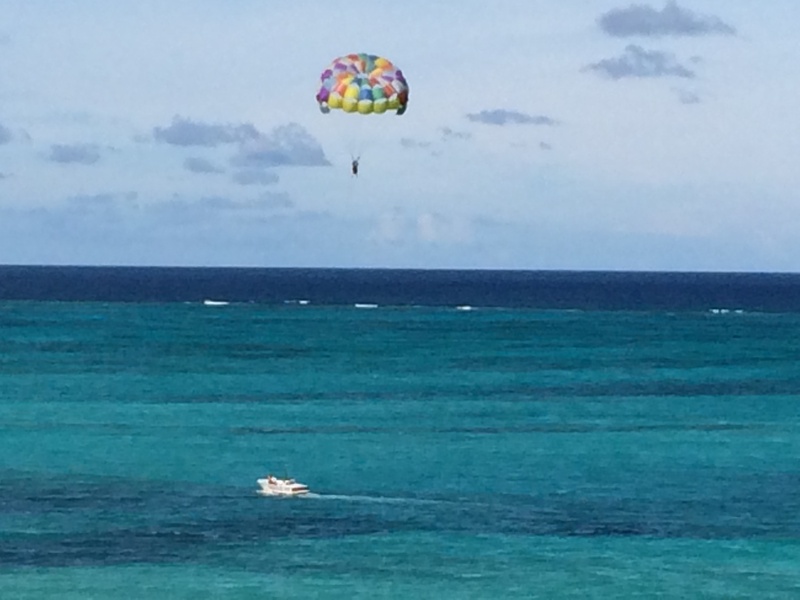 Got to Nassau mid afternoon. We were greeted by a very long line to clear customs. We took a cab to the hotel. We don’t have a car here. I don’t like driving on the “wrong side of the road”. 🙂 We are right on the beach. The water is so turquoise and beautiful here. Here is the view from our deck!! We are a short walk down the beach from another hotel that has tennis courts so we practiced there with another player who is staying there. And did the same on Sunday. After sign in on Sunday we decided to go down the street and have some Thai food. Pretty good. The weather turned VERY windy and a lot of rain during the night. The rain subsided, but the wind didn’t. Sasha played second match on, following a 9am match. The wind was blowing hard (25 mph with bigger gusts) and a rain delay. 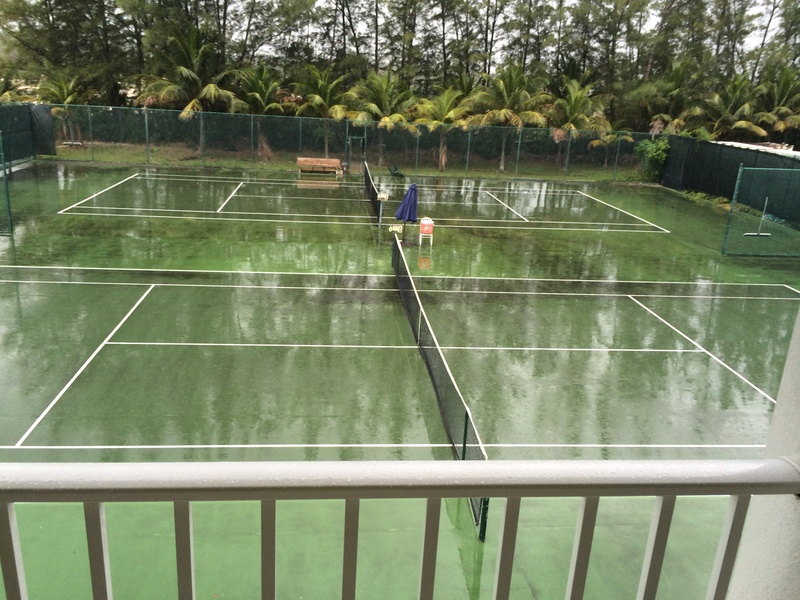 Not ideal conditions, but Sasha played pretty well and won 3 and 2. We have tomorrow off since they are playing the 6 day format and it’s a 32 draw. He will play Christian Langmo on Wednesday. Tomorrow we will practice. Here is a pointer to the tournament draw and order of play. 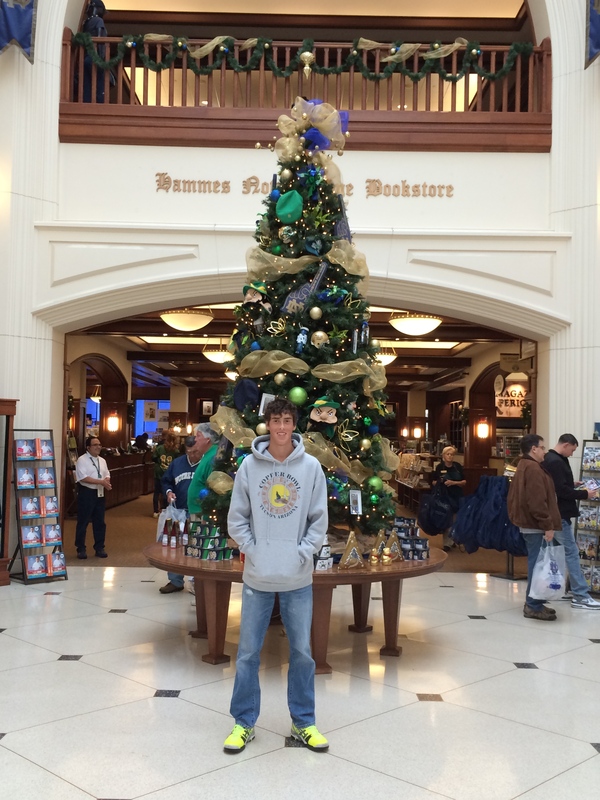 Made an unofficial visit to Notre Dame. 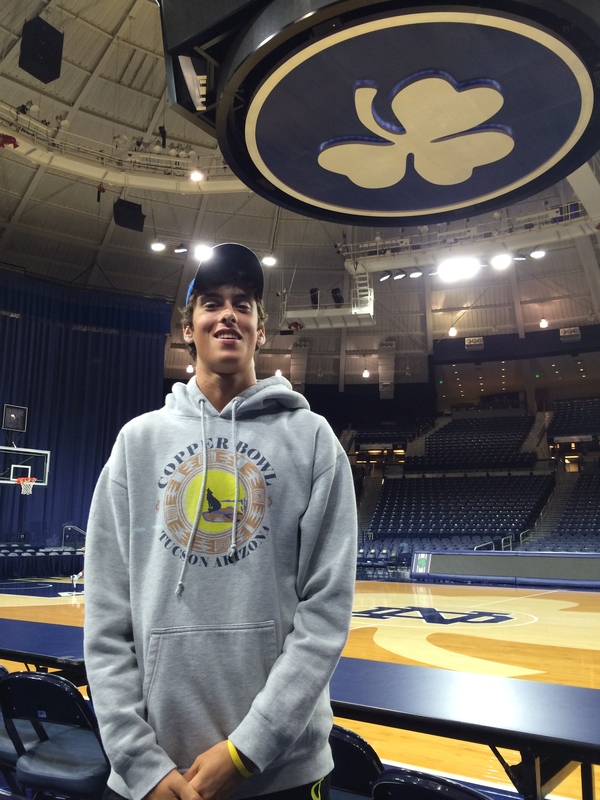 Sasha practiced with the team and got to experience the ND atmosphere. This is an incredible school for student athletes. Absolute state of the art facilities!!! Here are a few pictures from there. Sasha lost yesterday to walker Duncan 4-6, 7-6(5), 3-6. As you can tell it was a very close match. He played well. Stayed with the game plan, but so did Walker. Came up a bit short. If Sasha played that way every match, he’d have a higher winning percentage than he already has. He served great, returned well. Volleyed great. But walker sliced low and short to Sasha which gave him something new to contend with. Next time we will be very ready for that. It’s something Sasha will see a lot now, players and coaches coming up with a plan against him. You become visible, people develop game plans against you. We now get a much needed break. Sasha played matches 11 days in a row. That’s tough physically and mentally. We are going to Delray until next Wednesday for some rest, school, off court gym work, and to kick back a little. Then we visit Notre Dame. 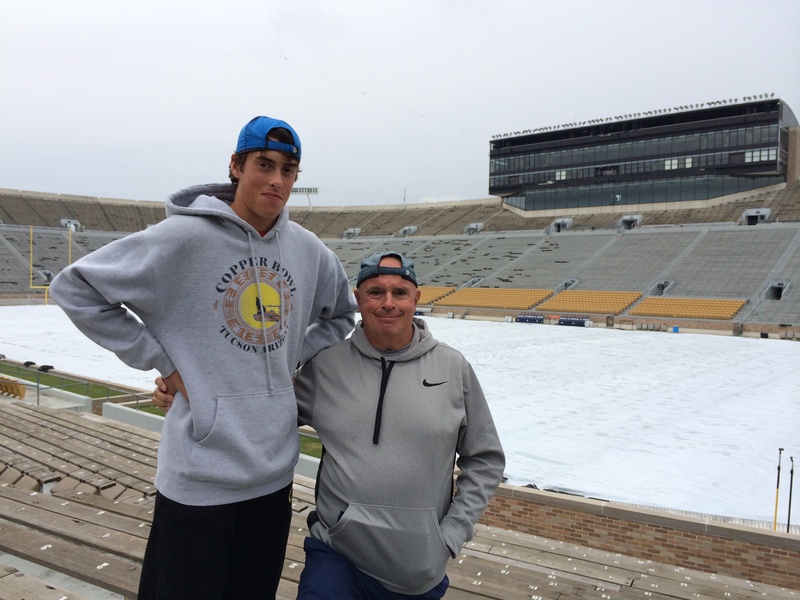 We are both looking forward to both Delray Beach and our visit to ND. Hi All, Sasha won his match against Liam Caruana today 7-5, 6-4. He played well. It was windy and Liam is a very good player. So this was a good win. Play tomorrow starts at 9:30. So we are in our rest, recovery routine focusing on tomorrows match. Sasha is now approaching top 900 in the world. A fantastic achievement and this is just the beginning!!! New ITF Rankings for the week Moved up 373 spots!!! Sasha qualified in South Carolina and played a good match today. The schedule is nice–gives a full day off. Boy’s play second tomorrow and doubles is tomorrow. Here is the draw and order of play link. Sasha lost in the quarters in Atlanta to Terrence Whitehurst. Wasn’t his best playing. I think the wins over Boyd and Kessler were a bit too much to process and he told me today–I just felt that run had to end. So we left Atlanta after the match and drove to Lexington, SC. Sasha played his second round qualifying match today (1st rd bye because of seeding). The guy he played is a solid 4 star, not a bad player and Sasha crushed him 6-0, 6-0. The first set was 17 minutes and the second not much longer. He played with such confidence. Gave us the opportunity to talk about taking that tennis on to the match court all the time. Obviously there will be better players and it will not be 0 and 0 all the time, but with the attitude and confidence he exhibited today, we are making big time progress. We are both looking forward to some downtime after this tournament. He will be catching up on school and we will go to Chicago practice with the Ross’s, Vincent Lin, Martin Joyce et al. Then we will make an unofficial visit to Notre Dame. Sasha played an incredible match here yesterday to move into his first quarter final of a grade 4 ITF event. Playing in howling winds, he came back from a 1-5 first set deficit to win 7-6 (2) over fellow TR Blue Chip McClain Kessler. After a very long first set where he saved 7 set points, Sasha closed out the match with a 6-1 second set win. He played so well against an opponent who known for never giving up and being willing to grind all night if necessary. One of the other players said before his first round match, “oh, they have lights here, we can play all night”. In winds that blew at 25 miles an hour, the tennis wasn’t clean–players had to keep the ball in the court and be patient in looking for their opportunities. Sasha came out trying to play his aggressive game, but adjusted very well during the match. He was patient, waited for his chances, but went for his shots. We have been working on adding the down the line backhand to Sasha’s game. He hit a HUGE down the line backhand on match point. I’m so proud of how well he adjusted and focused in this match. Tomorrow he has McClain Kessler–yet another Blue Chip opportunity. That’s why we are doing this–to play these better players. Great to see Sasha step up and play the big tennis that is needed to win these matches. You are currently browsing the TennisAdvisor's Blog blog archives for November, 2013.